I love Escher's work... always have. Did you know he was a from a family of architects? They expected him to be as successful as them and join in the family business; however, when he failed dreadfully at maths, and his drawings became illusions and didn't work 90% of the time, his father sent him to Florence to work on his style; to make him practice on the architecture of the buildings there. However that didn't work either. One day, he was in one of the main big squares sketching - and feeling horrible about how he was failing his family - when an art dealer walked past and glanced at what he was drawing. 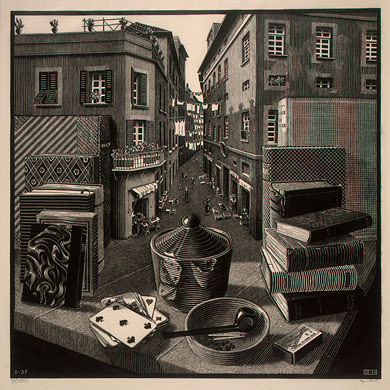 The dealer was totally blown away at the work; and how it turned into an illusion with a few strokes of Escher's pencil. He asked him if he had any more work; and Escher said he had an apartment full of failed drawings. When he took him back there, the art dealer offered him an exhibition; and Escher became known as an artist instead of what his family wished him to be. I am doing and art critique on this print, and this is one of my favorite works by M.C. Escher. His use of perspective and architecture amazes me!! He is my favorite artist, and I love how he wasn't apart of any art moment or anything. His own use of surrealism and complexity is just incredible.